Turtlenecks. 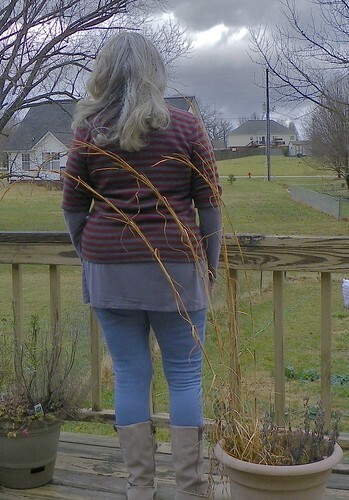 I love them for layering in the winter and KS 2740 has been my go-to pattern. 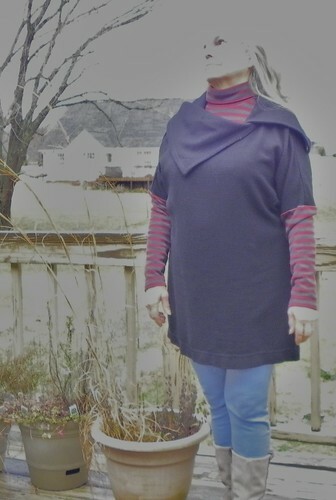 I wanted one made of the sleeve fabric of the Vogue 8778 tunic that just came off the sewing machine. Just as I went to take these shots a ferocious wind storm blew up and my camera decided to FAIL at point and shoot. KwikSew 2740 is another pattern that has had a long life and I see that it is no longer listed in the active patterns at the KwikSew.McCalls.com website but is still offered for sale by other resellers and ebay. It’s worth chasing down for close fitting turtleneck tops. 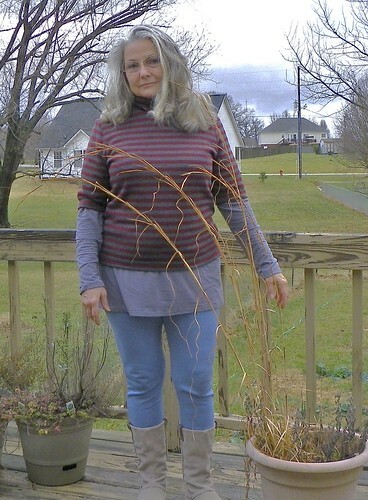 Posted in Pattern Reviews, Sewing and tagged Pattern Reviews, Sewing. Bookmark the permalink. Mary Beth, love both the tops. I love the turtleneck!! It goes perfect with the outfit. Also love the Vogue pattern. Absolutely spectacular and and welcome back. Opsie, won’t let me pin. Your tops are wonderful. I like your “art” shot, too! PS. Don’t you ever have a bad hair day? I like the Art Photo Shoot!! cute top, too!! Both this top and the very colorful sweater knit look great, as do you!! Happy Christmas Mary Beth. Good to see you back. Thank you *so much* Ruth – Merry Christmas to you as well.